A page-turning whodunit for fans of Peter Robinson, David Baldacci and James Patterson. Since reading my first Rachel Amphlett novel, she has been a favourite of mine and I particularly love the Detective Kay Hunter series. This is the fourth book and, as with all the best crime series, each book has it’s own case to solve whilst there is another lurking in the background – and this is the one where we find out what is going on in the shadows. Kay Hunter is a good police officer, working hard at solving the crimes assigned to her but she has an unfair black mark hanging over her and has been working surreptitiously to find out what happened. The suspense has been building nicely over the previous novels and it never lets up in this one. I confess to suspecting almost everyone except the guilty party – always the sign of a well-plotted tale! One of the best aspects of this author’s writing is there is no hanging about at the start of the book; each novel is straight into the action and keeps going to the bitter end. This, as with her others, is a very hard book to put down. So much happens that I found myself keeping going ‘just a little bit more’ and before I knew it had reached the last page – and then wished I was only just beginning! A terrific story, well plotted and a heart-thudding adrenalin pumping read. I really hope to see more of this detective. 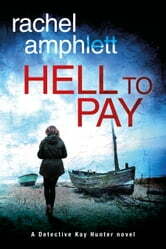 My thanks to Rachel Amphlett for kindly letting me read an arc of Hell to Pay. This is my honest, original and unbiased review. Excellent read. Kept me wanting to read all night long. Can't wait to read another Rachel Amphlett book. Love this series. Hope Book 4 is out soon to continue the Kay Hunter crime series with her very supportive and loyal crew. Wonderful characters developed to the point I feel like I know and care about them. Enough twists and turns to make it a quick read.